Younger Daughter and I had a long but uneventful trip home yesterday. Wow, it's good to be home! Before we left Portland, we made our annual excursion to the incredible Powell's Bookstore ("City of Books"). I go every year, but this was Younger Daughter's first visit. Well, first visit as a young adult rather than a young child. On the way, we marveled anew at the massive and graceful bridges spanning the Willamette River. As we turned onto Burnside Street, we momentarily came face to face with Portland's Chinatown. Younger Daughter snapped this shot. She also liked this contemporary fountain in front of an office building. Before we could get into Powell's, however, we had to park. The parking garage is crazy, with steep ramps and tight corners and itty bitty parking places and inconvenient support pillars. Better than parking on the street, however, especially with a car-full of stock and other enticements. But Powell's is worth any parking difficulties. It's a bookstore that has to be seen to be believed. This ediface takes up one entire city block and is four stories high. As soon as we entered the store, I pulled out a map and showed Younger Daughter how it's laid out, color-coded according to category. Upon finding out this was Younger Daughter's first (adult) visit, the info lady cheerily gave us a couple of "I Got Lost in Powell's" stickers. We spent a happy couple of hours and came away with seventeen books. Love that place! But then we had to drive home. Ug. How glad I was to have Younger Daughter along for company. ...and plunged into the dramatic beauty of the Columbia River Gorge. Most of the photos were taken by Younger Daughter. Here she was trying to capture the green tint on this bywater, but unfortunately the window reflected her photographic efforts. We stopped for gas in Hood River and were appalled at the prices. This dramatic escarpment always impresses me. A long train of flatcars with truck bodies, way way way across the river. We passed this gasoline tanker, but from the advertisements on the back it looked just like it was a tanker truck full of coffee. What a thought. This isolated but massive farm (irrigated with water from the Columbia) across the river from us always amazes me by its sheer size. We came upon a truck stating its contents were "organic," but we couldn't really determine what it was transporting. Turned out to be carrots. These are World War II-era bunkers (?) -- hundreds of them dotting the landscape near an armory. The bridge over the first of two loops of the Columbia we cross into Washington. The bridge over the second loop of the Columbia that takes us into the Tri-Cities (Pasco/Kennewick/Richland) of Washington. The last major leg of the journey is when we turn off Hwy. 395 (phew!). It's been a dry summer, and in many places the wheat had already been harvested. Lots of rolling wheat fields around here. Farmers were also baling grass hay. See that rectangular stack? Those are thousand-pound hay bales, about 250 of them stacked up. Wheat behind a rail fence -- classic country. 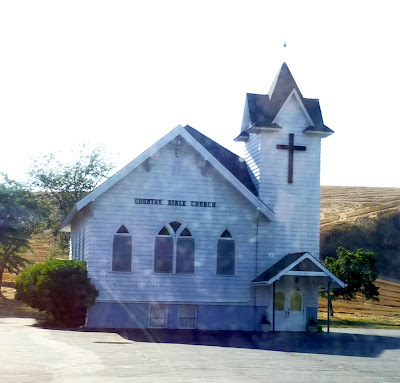 We passed this charming little rural church. The final push before dropping into Colfax. Are you getting bored of scenery shots? Ah -- now this is the sign we were waiting for. They baled the field across from us during our absence. Now came the painful aftermath: unpacking the car. Doing mounds of laundry. Et cetera. Phew -- the festival is over! It's been an exhausting five days, but now we're done and we'll be heading home. Sundays are usually (and understandably) our slowest sales day, but yesterday we sold 28 pieces! For a Sunday, that was spectacular. Overall for the show, I sold 137 pieces, which while not as high as last year, certainly exceeded sales for all previous years (which have averaged 110 or so pieces). So it was a nice end to a tiring trip. Here are some photos from the day. I stopped and looked at the map of where visitors are coming from. It was much more filled in than it was after the first day -- folks hail from literally all over the planet. ...and many many from Europe. Every state in the nation was comfortably represented. Here's the underside of the massive Morrison Street Bridge. It's hard to appreciate these behemoths until you see their structural supports up close. I've always been fascinated by this complex collection of bridges and highways. A cheerful young man let me take a photo of his -- earplug? earring? -- which was square. A man came in and bought a rather astonishing four tankards. When I asked if he wanted a bag, he preferred instead to string them on his belt. Advertising -- works for me! Actually this generous fellow bought five tankards, but he gave one away to someone else who couldn't afford one. As it turns out, he told me that he's been down-and-out at times in his life, but now he has a business that makes him a lot of money, much more than he needs. He was on a one-man mission to give it away -- by being generous to strangers, by being generous to crafters (he patronized all the other booths around us)... it was a lovely philosophy. Here was a delightful pair of blog readers, Connie and Devin, who stopped in to visit. I just love it when I get to put names to faces and meet readers. Fortunately they came at a time when it wasn't too busy in the booth, so we were able to visit for awhile. In honor of the occasion, Devin wore a T-shirt he knew I would appreciate. As the afternoon wore on, we started removing the lower shelves of the shelving units in order to keep the upper shelves looking full. This couple was enthusiastically dancing to the music from the band. They happened to be standing in a shaft of sunlight, which made his yellow suit more distinctive. Thankfully this fashion trend of wearing pants below the rear is waning. I really don't care to know what color someone's drawers are. It was interesting to note how he handled a simple act like sitting. By 7:30 in the evening, the booth was well on its way to being disassembled. Tim and I returned home to find my friend Wendy had bought me an interesting local concoction: a bacon maple donut from a bakery called Voodoo Donuts. Younger Daughter wants to assure everyone that these donuts are "insanely good" and they "melt in your mouth," but (ahem) I was underwhelmed and let her finish it. All in all it was a tiring but very satisfying selling trip. Younger Daughter and I will be indulging in a trip to Powell's Bookstore shortly after I post this, then heading out for the long drive home. Thanks for coming with me to Portland!